By Costa Maragos Posted: March 18, 2017 8:30 a.m.
Caleb Behn, lawyer, environmental activist and the subject of a critically acclaimed documentary, is the featured speaker at the U of R’s latest Deliberation and Debate series. Behn is Eh-Cho Dene and Dunne-Za/Cree from Treaty 8 territory in northeastern B.C. His talk, organized by the Aboriginal Student Centre, takes place March 23 at 7:00 p.m. in the Education Building (ED 193). The release of the documentary Fractured Land vaulted Behn to national prominence. 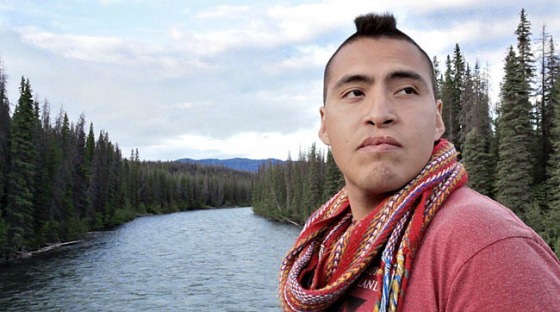 The film documents Behn’s journey as he tries to reconcile his peoples’ need for oil resource industry jobs in northeastern B.C., while ensuring the environment is protected. The title of Behn’s talk is Indigenous Water Law in the Anthropocene: Reconciliation Beyond the Human. In his presentation, Behn will present aspects of the rapidly emerging and evolving Indigenous Water Law in Canada, which deals with the ownership, control and use of water as a resource. Caleb will argue that the application of Indigenous Water Law represents a path forward for Canada and the world. Prior to his legal career, Behn was the oil and gas officer for the West Moberly First Nations and the lands director for the Saulteau First Nations. Behn specializes in environmental law and sustainability. Following Behn’s presentation, there will be an opportunity for members of the audience to ask questions and engage in an open forum discussion. This is the fourth presentation in the Deliberation and Debate Lecture series. The series features prominent speakers who address important questions and foster critical and respectful debate on campus.